This book provides an essential historical framework for understanding global business. The author shows how entrepreneurs built a global economy in the nineteenth century by creating firms that pursued resources and markets across borders. It demonstrates how firms shifted strategies as the first global economy disintegrated in the political and economic chaos between the two world wars, and how they have driven the creation of the contemporary global economy. Many of the issues of the global economy have been encountered in the past. This book reveals how entrepreneurs and managers met the political, ethical, cultural, and organizational challenges of operating across borders at different times and in different environments. The role of multinationals is placed within their wider political and economic context. 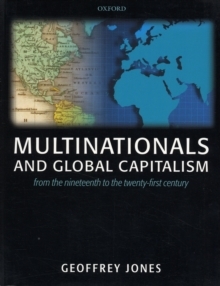 There are chapters on the impact of multinationals, and on relations with governments. The focus on the shifting roles of firms and industries over time provides compelling evidence on the diversity and discontinuities of the globalization process. The book explores the history of multinationals across a wide spectrum of manufacturing, service and natural resource industries. By providing an accessible survey of the history of international business worldwide, this book will be key reading for students taking courses in International Business, Business History, andEntrepreneurship; and of interest to academics and researchers working in these areas.